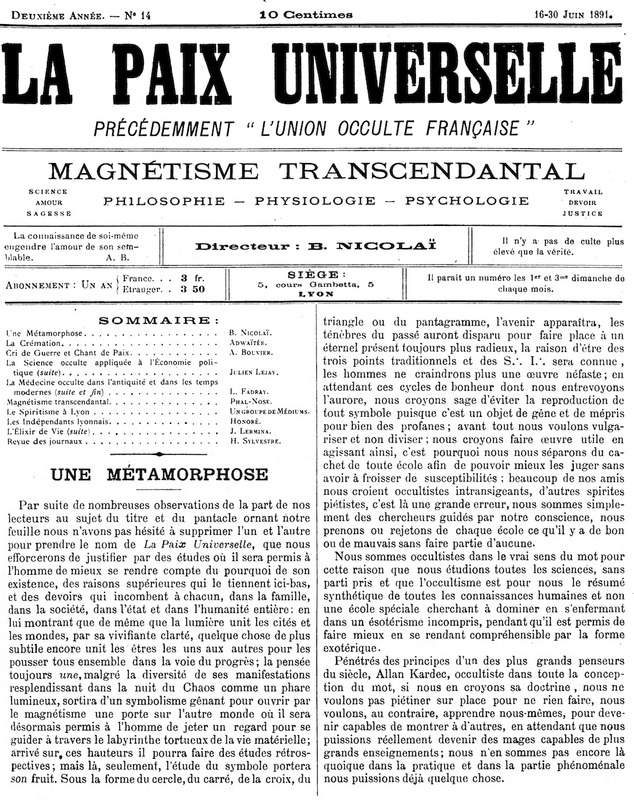 Revue Independante de Magnetisme, Spiritisme, Psychisme, Hermetisme / Magnetisme Transcendental. Philosophie Physiologie Psychologie. Lyon, France. Language: French. Editor: B. Nicolai; A. Bouvier. 2/14, June 1891-1910. 8 pp., 3-5.25 francs. The numbering continued that of L'Union Occulte Francaise, but this journal, as the editor announced in its first issue, radically changed its direction away from "occultism" and toward the more traditional interest in spiritualism/spiritism. The change did not last. L'Initiation for May 1892 notes an article in the journal by L.-E. Fabre des Essarts on Auguste Comte, and L'Isis Moderne for 1897 notes the collaboration of Ernest Bosc. The journal ran regular contributions by Flammarion, Leon Denis, A. Jhouney (Jounet), Marc Haven, Albert de Rochas, Charles Fauvety, Eliphas Levy, Le Clement de Saint-Marcq et al., and many occult authors more prominent in Lyon than nationally. Papus, in his "Presses neo-spiritualistes," 1896, says that it is an "eclectic" journal of occultism, spiritism and magnetism. BNF; BM Lyon; Munchen UB; LOC.